Orson Hyde Eggleston journaled his experience of the settling of Afton Wyoming. Part two covers January and February of 1886. 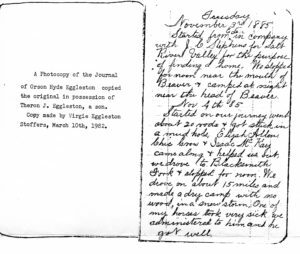 Orson Hyde Eggleston wrote a journal account of his journey in the fall of 1885 to Star Valley and recorded the early settling of Afton Wyoming. Part 1 covers November and December of 1885. Some years ago Virgie Eggleston Stoffers gave a photocopy of Orson Hyde Eggleston’s journal to my father. I think it was some time after that, but in the late 1990’s, that I found this at my father’s home. A typed note indicated that Virgie had made a photocopy in 1982 from the original which was then in the possession of Theron Eggleston. When I visited Theron’s daughter Ruth, I did not find the original notebook there. It may have been, but it was not something that I saw. It does appear that Virgie might have written over the writing on her copy in places to try to make it darker. It is not an easy read, and some places numbers don’t make sense as written. At some point I painstakingly transcribed the whole thing. 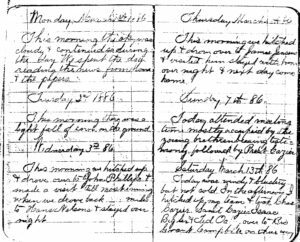 Much of it consists of weather reports, but there are accounts of interesting events during this six month period from November 1885 to May 1886. Because of the length I have broken it into three parts. 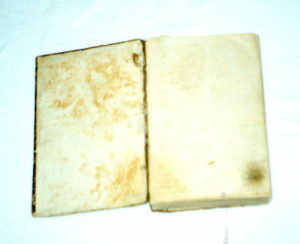 Part 1 covers November and December of 1885. Family Bibles are wonderful sources of information. I found this Bible when I visited Cousin Ruth several years ago. She indicated that it had belonged to Orson Hyde Eggleston and had been given to her father Theron Eggleston, probably by his father Orson. 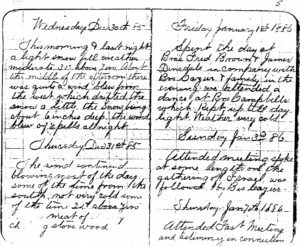 It appears that it may have been in the possession of Joseph S. Eggleston at some point and he may have entered at least some of this information himself. Ruth let me take this Bible to make photocopies of the Family Record entries. Sometimes a old book is more than just an old book – it is a tangible trace of someone’s life – a treasure worth much more than the value of the volume. At one point in my genealogy journey, I made contact with a second cousin named Ruth. She was the daughter of my father’s Uncle Theron Eggleston. Somehow, Theron had assumed the role of family genealogist in his time – I can relate to that. 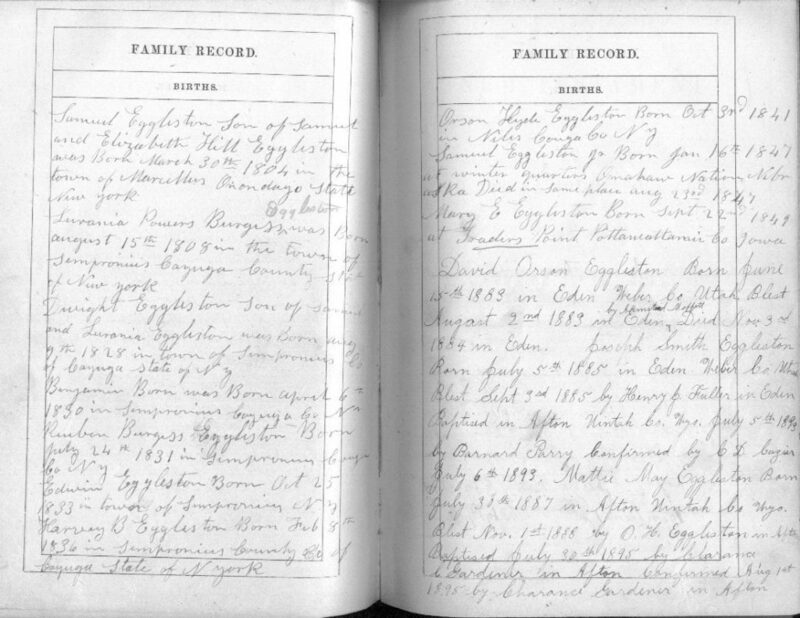 He apparently had been given his father Orson Hyde Eggleston’s records. Theron also lived in Salt Lake City near the Utah Genealogical Society and he and his wife Emily spent much time there researching during the early to mid-1900’s. 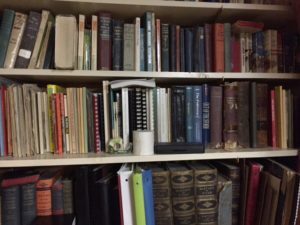 I made a visit to Ruth’s home in West Valley City, Utah and found there a genealogical gold mine. Her basement was filled with boxes and file cabinets full of records. This was before I had a cell phone which could take pictures, so we filled a box with selected documents which she let me take to make photocopies. I am feeling somewhat burdened by stuff. Having lived in the same house for 36 years where my husband and I raised three children who have since moved out, I fully realize that we have accumulated a lot of stuff – way too much stuff. I and my siblings have also been encouraging our 90-year-old father to get rid of some of the stuff he has acquired during his long lifetime and stored over 50 years in the same house. My father grew up during the depression and has a deeply instilled sense that things should be kept in case there is a future shortage or they may again be useful to someone. He is now willing to give away things to family members, but there are definite differences between what he thinks might be useful and what they might really want. My children are of a generation which seems to be able to easily dispose of stuff. If they find later that they need something they got rid of, they just buy another. I personally am somewhere in between – I really want to rid myself of unnecessary stuff cluttering my home and life, but I also see value and meaning in some things, which makes it harder to let go. We are the chosen. In each family there is one who seems called to find the ancestors, to share the family story, to safeguard the family treasures. We are the storytellers of the tribe. We are the keepers of the records. We are the family archivists. 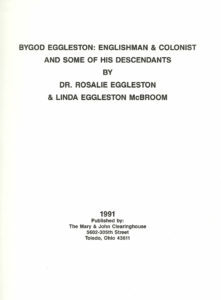 As I got into serious research on the Eggleston family, I became aware of a wonderful book: Bygod Eggleston, Englishman & Colonist and Some of His Descendants, by Dr. Rosalie Eggleston & Linda Eggleston McBroom and published through the Mary & John Clearing House. “Prepare a Book of Remembrance” – This was never an item to be checked off a to-do list, but rather the creation of a dynamic entity, ever expanding with new discoveries and evolving in format through technological advances. 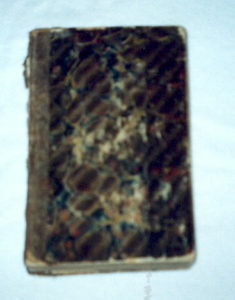 “Prepare a Book of Remembrance” was counsel I was given as a young woman. My Book of Remembrance was actually already begun, but I had no grasp of its significance. 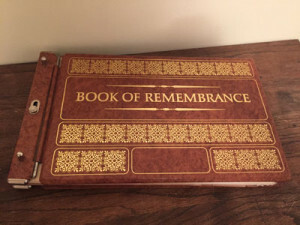 I grew up being familiar with a “Book of Remembrance”, an expandable legal size binder full of pedigree charts and family group sheets, which my parents kept. This was kind of a requirement for faithful members of the Church of Jesus Christ of Latter-day Saints.The earliest beginnings of my own Book of Remembrance was when my father gathered us kids at the kitchen table, showed us his Book of Remembrance and gave us blank charts to hand copy information on to. I also remember him telling us stories about the people whose names we wrote and showing us a few old photographs. I remember at least one time going to the local Family History Library with him and looking at microfilm. It was exciting to see our family name projected onto the screen, but it was all still rather abstract.